Disgruntled criminal Henry Camp joined forces with the Wrecker and became the hero-crushing Bulldozer! Well, well, well, look who got their own unique bio! A year and a half ago, when Bulldozer was supposed to be a "swap figure" for Wrecker, all he would have gotten is the same generic text as his boss. As it is, he's now the only member of the Wrecking Crew to get his own name anywhere on his packaging - either his real name or his supranym! Suddenly Henry Camp is looking like the most important part of the team, rather than the last outstanding remnant. Whatever. All we care is that the toy finally exists and is in our grubby little hands! Bulldozer is built from the same body as his buddies, so he is equally huge. The upper body is shared with Warpath, which means he has Hulkling's arms and a torso that's detailed like muscles, rather than a vest. He's gone through more costume changes than any other member of the Wrecking Crew, but this is a fairly modern one. Designed by Mark Bagley when the Wrecking Crew went after the Thunderbolts, I believe. Compare it to the original. 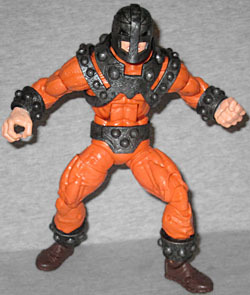 The bracers are molded as part of the hands, while the armor on his shins is a separate piece fit over the existing boot. 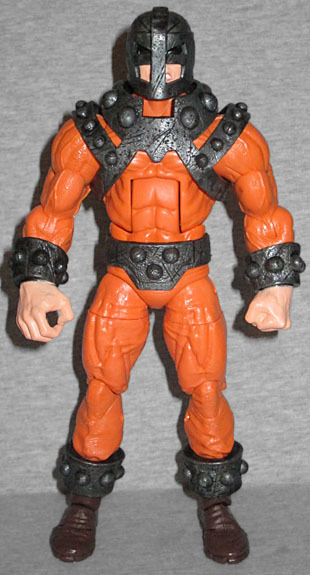 His belt and chest harness are free-floating pieces. His helmet offers an extra level of protection thanks to the strip of metal running vertically over the top of the head and down over the mouth-hole. His eyes are sunken deep in triangular openings, but they're just painted solid black - a cost-saving measure? The metal bits all have a nice texture to make them look scratched and dinged. Like Juggernaut or Ram-Man, Bulldozer's battle strategy is to run at things with his head. Fortunately for us, the figure's mix of ToyBiz and Hasbro-style articulation means you can get him into some really cool poses. 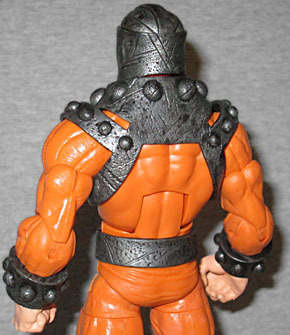 He has a balljointed head, hinged neck, swivel/hinge shoulders, swivel biceps, hinged elbows, swivel wrists, hinged torso, swivel waist, swivel/hinge hips, swivel thighs, double-hinged knees, hinged and rocker ankles, and hinged toes. It's weird that there's no kind of shin swivel, but not something that will really be missed. Bulldozer doesn't have any accessories, but he does have the right arm of this series' Build-A-Figure, Ultron. The movie version, not the comic version. 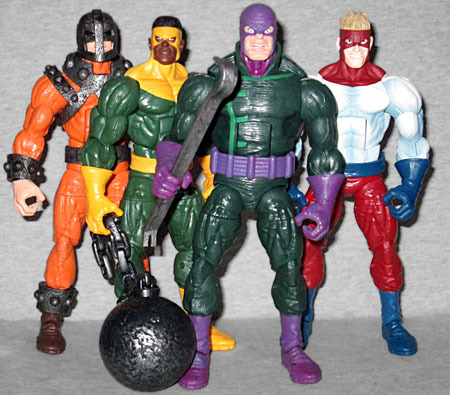 It's been a long wait for this big orange lunk, but the important thing is we've got him now, and at last the Wrecking Crew is complete (even if they are more in scale with Marvel Select than Marvel Legends)!